Over the past few months I've become a roadtripping champ, but one place that I'm getting particularly good at going is Louisville, Kentucky. 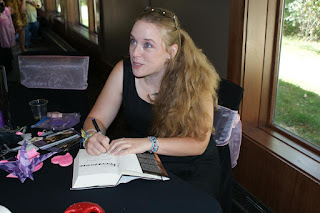 Just last month I was there to celebrate the release of Kelly Creagh's Nevermore at a special party she invited myself and a few other bloggers too. ﻿﻿﻿﻿﻿﻿﻿﻿﻿﻿On Friday, September 10 Monica from Bibliophilic Book Blog and I hopped in the car as we so often do and headed west on I-64. 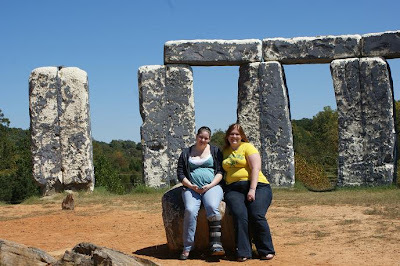 After a short detour to my favorite strange Virginia tourist attraction, Foamhenge, it was a smooth ride into West Virginia. 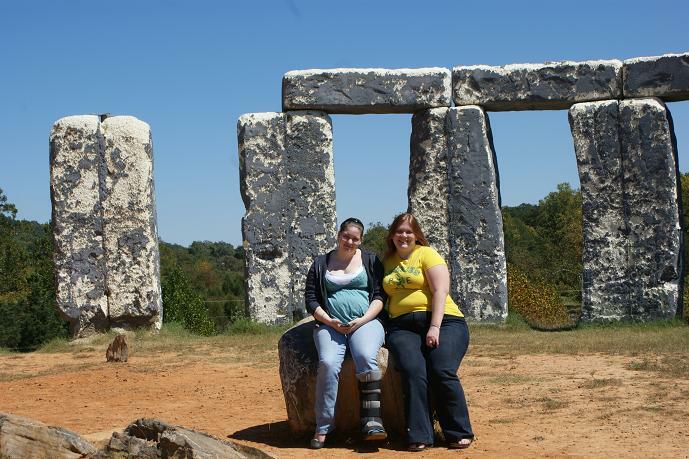 Monica & I at Foamhenge in Glasgow, VA.
We even stopped in White Sulphur Springs (great town name!) for lunch and I had "Honey Stung Fried Chicken." How delicious does that sound? I'll skip over all of the details about traffic jams and neverending construction zones even though I know you want to hear all about it. All I'll say is that, if I had the power, I would remove the offending land mass that is West Virginia and push Virginia and Kentucky together. It would shave a good two hours off the trip. After what seemed like forever, we finally made it to the hotel and crashed hard. The next morning we met up with Julie Kagawa at Borders and kidnapped her for the day. We ate endless breadsticks at Fazoli's, traversed the city in search of copies of Nevermore, visited a hobby shop for sealent, and finally wound up back at the hotel where we kicked off arts & crafts time. "With the tree and the cranes, and I was like...*fanning herself with one hand and feigning sobs*"
That description got her mocked for an entire weekend, during which Julie and I brought up trees, cranes, and crying at every opportunity. They got drawn on napkins and pictures of trees and cranes got tweeted at Stacey pretty much non-stop and there was much laughter. So, when we sat down for art therapy, there was no maccaroni art. Julie did her best to teach us how to paint Grimalkin on a rock while Monica listened to the monotone man on her phone describe how easy it is to fold a paper crane, all the while cursing under her breath. 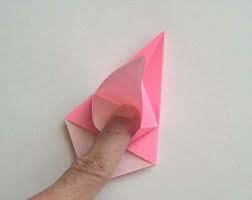 One day she will master the petal fold. Oh yes. We didn't fold 1000 cranes, so no wishes for us. However, I think it did sufficiently freak out the housekeeping staff. Not as much as our plan of acquiring a Justin Bieber poster and folding a giant Bieber crane would have, but there's always next time. Pizza was the next order of business. I found this place online that had great reviews and we all jumped in the car. My GPS took us on a senic tour of Louisville through old neighborhoods with giant, decades old houses that are now and probably will forever be way out of my price range. Finally, we arrived at Za's Pizza Pub. Shortly after we got inside a cheesy, delicious large pepperoni pizza landed on our table and we verified the reviews. It was, in fact, the best pizza in town. No disappointment here. Sunday morning we all hooked up for breakfast and Julie dragged her husband along. He was an amazing sport, and surprisingly did not order the obligatory man breakfast full of meat products and artery clogging goodness. He had lingonberry crepes. The greasey goodness was all on my plate, save the hashbrowns Julie took off my hands. Then came the Kelly's big party, which was not short of devastatingly gorgeous. The whole room was done up in blacks and pinks, and there was Nevermore paraphenalia absolutely everywhere. Kelly was dressed to match her book, wearing black dress with a pink ribbon around her waist. 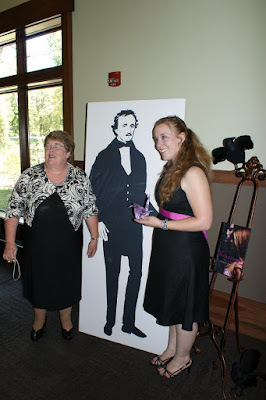 Belly dancers from Kelly's dance group entertained the crowd for a ew songs, and Poe himself even made an appearance. 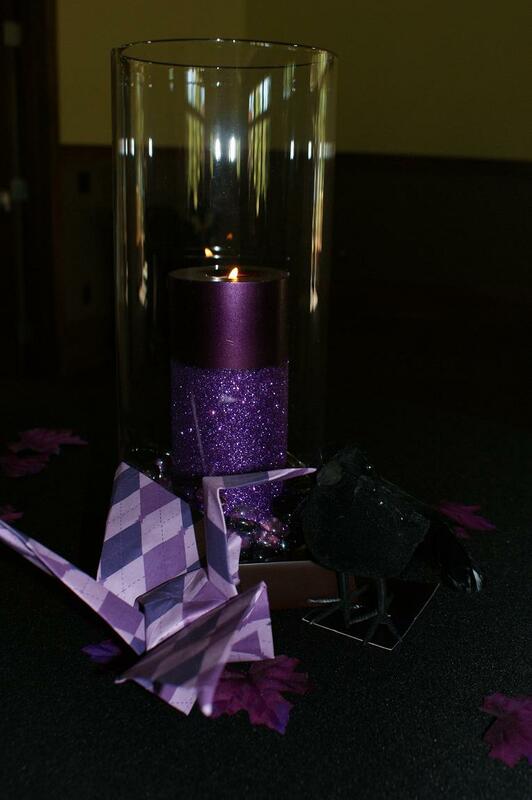 Of course we brought Kelly a purple crane to celebrate her book release. He flirted shamelessly with the ravens on the tables and even got his picture taken with the cake. 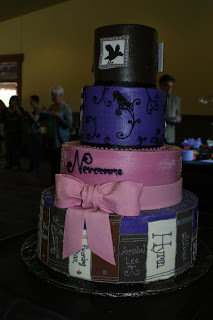 The cake was beautifully crafted in black and shades of pink and purple and decorated with the elements of Nevermore. It was was beyond perfect for the occasion. Kelly did a reading from the novel which captivated the attention of everyone present. Then she announced the winners of the door prizes and Stacey was one of the lucky ones! 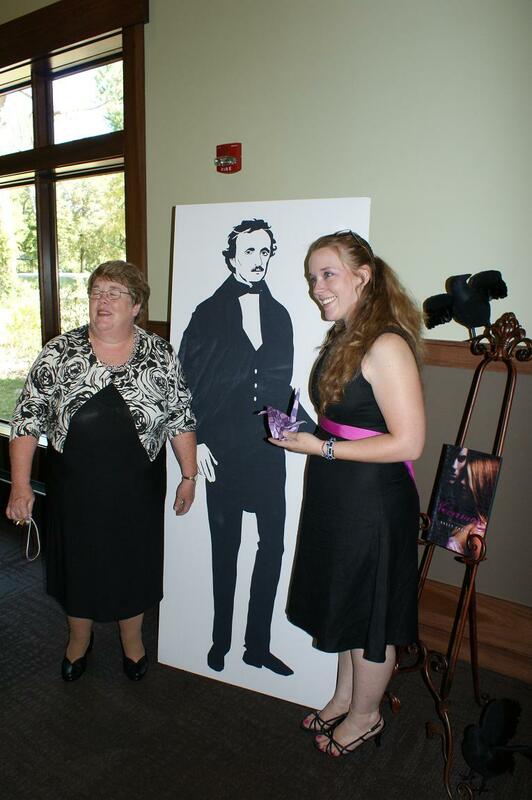 And being the nice girl she is, she shared the wealth by giving her Poe action figure to Monica. The gesture (and probably moreso the action figure) made Monica insanely happy. Afterwards she signed a lot of books. We stayed for a little while longer, eating the beautiful cake and listening to musicians sing songs about Poe. We left shortly after that and went back to the hotel to rest up in anticipation of the long drive home Monday morning. The entire weekend was such a blast. I couldn't have had better company, and I can't thank Kelly enough for inviting me. 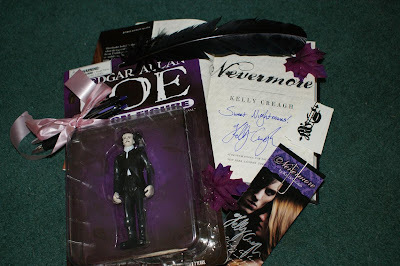 Fill out this FORM for a chance to win this awesome Nevermore prize pack, which includes a signed hardcover of Nevermore, signed bookmarks, purple pens, Cemetery Sighs tatoos, and an Edgar Allan Poe action figure! U.S. and Canda only. Ends 11/10 at 11:59pm EST. How fun!!! 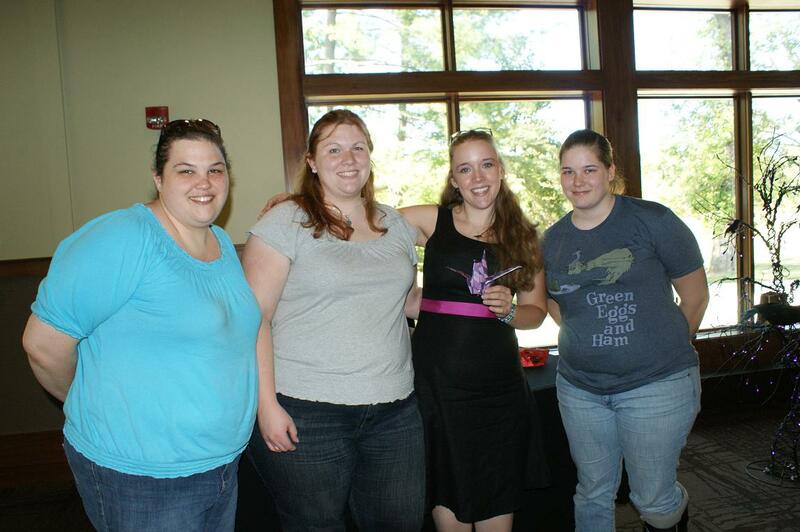 I love get togethers with authors and bloggers. They are so much fun. Oh, my! That cake is so gorgeous! I'd have a hard time cutting into it and ruining it. Thanks for sharing these picks and descriptions of what happened. Sounds like such fun! Great post looks like alot of fun I love the colors Great giveaway thank you so much for the chance! That cake is amazing! Looks like a fantastic time!! That cake is all types of awesome! I wish I could've been there! Thank you for such a great giveaway! lol the "beiber crane" had me cracking up. 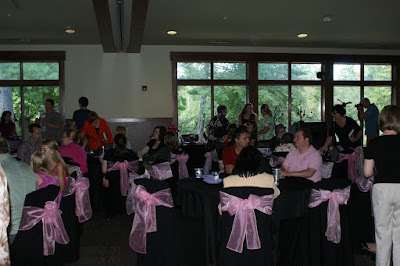 Sounds like everyone had a wonderful time and such great pictures!